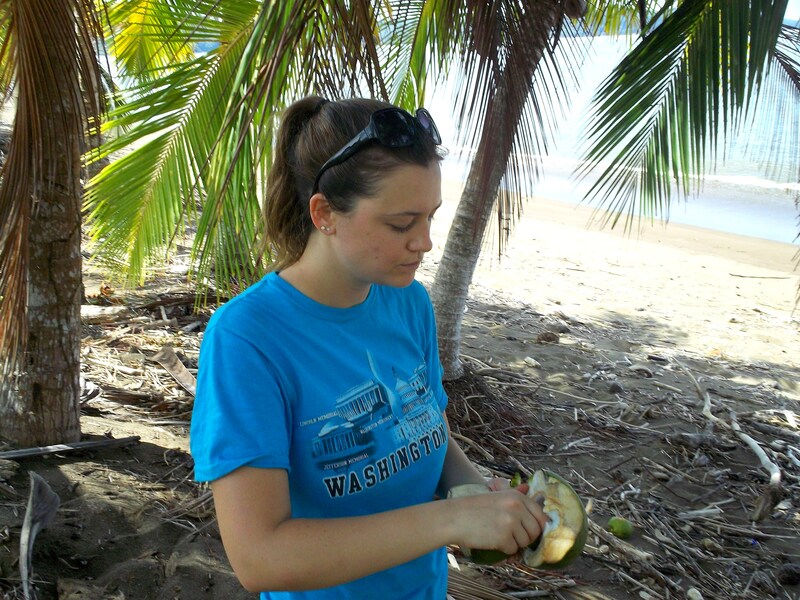 I had a great time in Costa Rica! 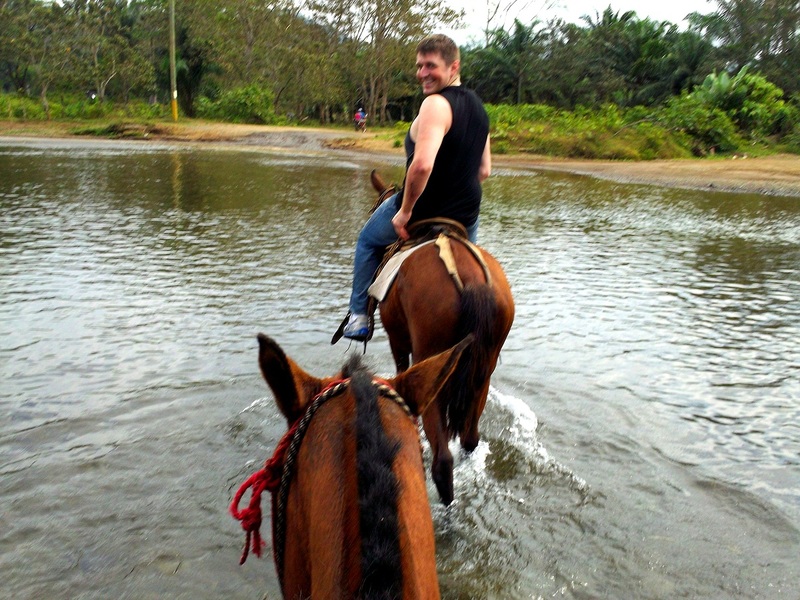 This is mainly due to horseback riding through the rainforest and on the beach! Matt had been talking about horseback riding for basically the whole trip and we finally had an opportunity to do so. I was nervous before the tour because I had never rode a horse before. They had scared me. To my surprise, it wasn’t scary at all. The tour started off with a slow walk on the road; I quickly got use to it and started to trot as we went through the rainforest! Matt was excited to go faster and wanted to go much faster than a trot (even through the water). The rainforest was loud with sounds of insects and filled with dark and deep greens. We saw all sorts of interesting animals, like bright red and yellow birds, a toucan, an enormous black snake slithering extremely fast (you could say I had a little freak out), a huge scary looking spider, plus the usual animals (dogs, other horses, and cows- most walking on their own, with no owner in sight). The beach was fantastic! 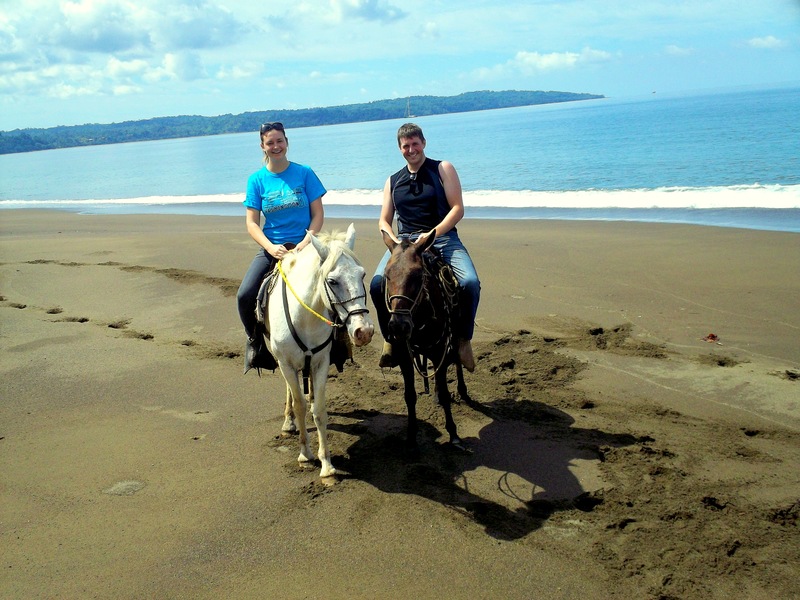 Matt, the tour guide, and I walked the horses out onto the sand, right down to where the waves were crashing. I could tell the horses liked the sand under their feet better because it was easier to get them to go fast. Really fast. Luckily, I had the fastest horse (sorry about your bad luck, Matt) and I was galloping down the coast line – I loved it – the rainforest to my left, the Pacific Ocean to my right, the powerful horse beneath me, the air all around, the speed, the fun and excitement, the ease of it all, and the all-embracing feeling of freedom. 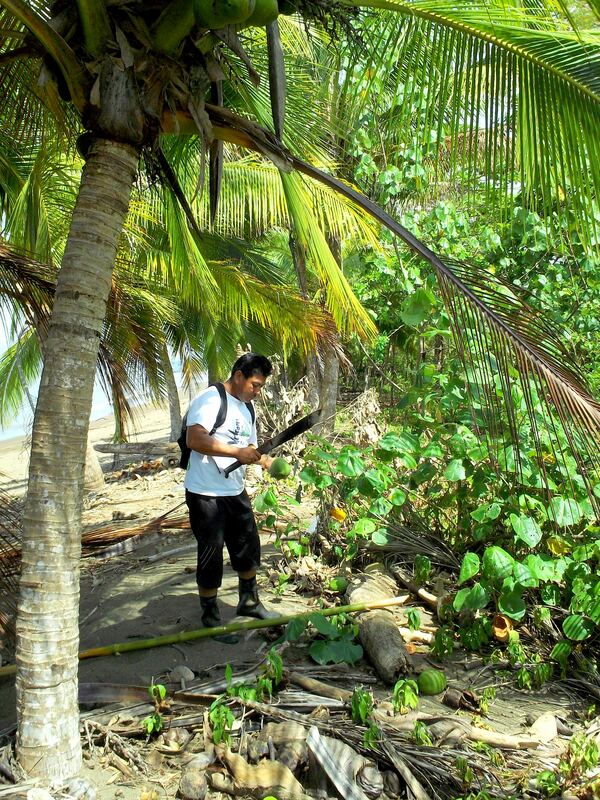 The tour guide had us stop at one point on the beach and he knocked down and cut open some coconuts with his machete. We drank them and ate the inside. Matt and I galloped down the rest of the beach in no time. The three to four hour tour took us two hours. I guess most people have the horses walk. Getting to and leaving Drake was a fun little adventure in itself: we took an hour boat ride there and back. And the place we stayed in was comfy (I really liked the hammock). As for technical stuff, the border crossing was the easiest yet and the roads are decent, except for if there is a pothole it is horrible- if the motorcycle were to hit one, we’d go flying. We’ve been told the roads are smooth in Panama, so here’s hoping. Also, we got pulled over in Costa Rica for passing a truck on a double yellow line. No one on bikes has been following any traffic laws in Latin America, so we’ve been doing this often- except this time we got caught. But the police man took a ten dollar bribe. Costa Rica has been the cleanest and most expensive international country we’ve been to, but the police are still corrupt. Can’t believe your getting to do all those exciting things. I’ll have to tell Vicki that you were horseback riding she’ll love it!! Have fun, be careful. Love these posts about your trip. It looked like so much fun. 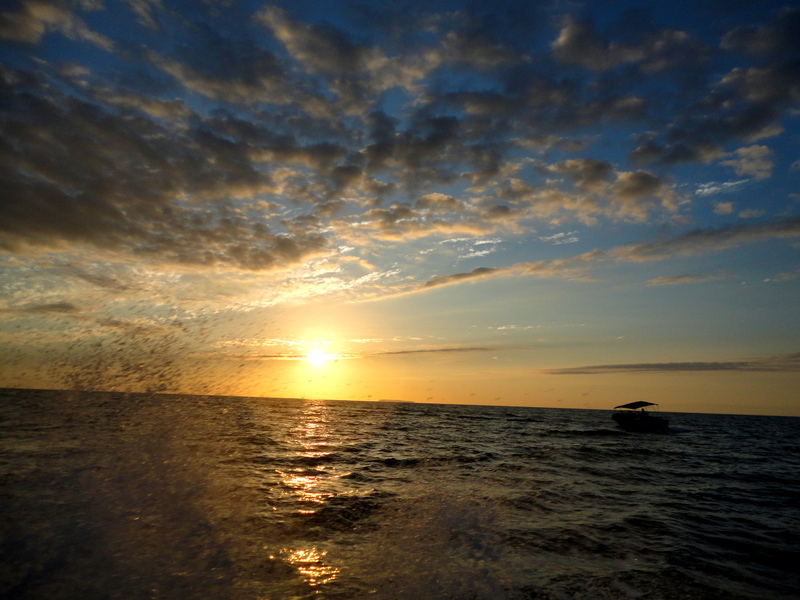 Costa Rica is beautiful. Looking forward to hearing about Panama. Wow Costa Rica looks beautiful. That beach picture was stunning. Love reading your posts and I check each nite for new ones! Keep safe. Love you!